The front desk opens form 9h to 12h and from 14h to16h. The answering machine might be on during the day. For any non-urgent information please get in touch by mail. The center does not provide internet access and mobile phones don’t always get through. Please organise your trip consequently (train timetables, contact with your family). A card use phone booth is available in front of the front desk. The closest town, Izeron is 50km away from Grenoble and Valence. It is crossed by the RN532 road. 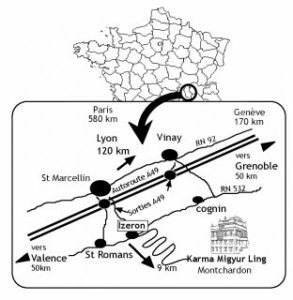 The A49 motorway Grenoble-Valence is not far and you can exit at St. Marcellin or Vinay. In Izeron follow the Montchardon sign and take the mountain road on the left. Caution Montchardon is in a mountain area at a height of 800m. If there is snow on the road, French law makes snow chains compulsary. If you plan to come to the center between november 15th and april 15th, make sure you have appropriate snow chains. If you use a GPS these are the numbers : Latitude 45° 08’ 53,9″ or 45,14805 ° Nord Longitude 5° 24’ 29,9″ or 5,40805 ° East Beware no access by the Cogning road in winter. The center cannot organise carsharing. no access by the Cognin road in winter. The closest station is St. Marcellin and our transportation service on demand will get you to the center. TGV trains get to Grenoble and Valence TGV station, then you have to get on a local train. Download SNCF local train timetables by selecting the Grenoble-Valence timesheet. The center offers shuttle service from St. Marcellin train station to the center (distance 15 km) and back twice a day except on Sundays. The fare for one way is 7 €. The shuttle to Montchardon waits in front of the train station and the trip takes approximately 30 minutes. Passengers are dropped in front of the train station. Please indicate your need for shuttle service at the time of registration, as the service is on demand only. You must confirm your need for shuttle service by mail or phone two days before the trip. Confirmed trips will have to be paid even if you found another way to get to the center. The shuttle leaves from St. Marcellin to Montchardon at 8.55 hours am and 17.55 hours pm. It leaves from Montchardon to St. Marcellin at 8.10 hours am and 17.15 hours pm. On Sundays, at the end of a course the center does not provide shuttle services from Montchardon to St. Marcellin. During your stay, please look for somebody to go with by car. If your arrival does not correspond to the transportation service times you can get a taxi from St. Marcellin.